Jagannath temple is one of the Char dham Hindu sites, situated in the Puri region.This temple is dedicated to Lord Krishna. 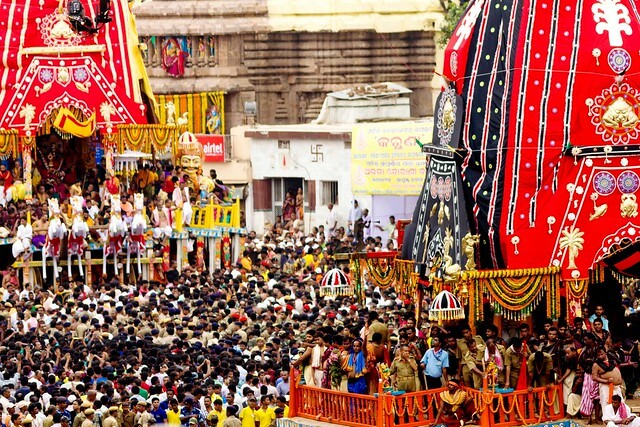 The chariot festival or Rath Yatra, is very famous all over the world. The temple is very nice architecturally built, with four entrance doors in four directions.The temple is opened only between 5 am to 12 midnight. So, a person can enter the temple within this time frame only. This being one of the holiest Hindu place, people from all over the world visit here. Bhubaneshwar is the capital city of the Odisha state. The city is very well-developed both culturally and economically. Bhubaneshwar is also called as the temple city of India, as this city has most of the temples here. The temples built here are architecturally wonderful and has been built very nicely. The climate of the Bhubaneshwar city is very beautiful and comfortable. Cuttack is one of the well-known and ancient cities in India. It is one of the main commercial city of Odisha now. The city name Cuttack is derived from the word Fort. The city is located very beautifully between the two rivers of Kathajodi and Mahanadi rivers. Apart from that, there are many of the attractive and picturesque destinations for the tourists here. Lingaraja temple is a very famous and very old temple, which been visited by many of the tourists. Somavamsi dynasty may have built this temple in the olden days. The temple is maintained by the Archaeological Survey of India and Temple Trust Board. Shivratri is the major festival being celebrated here. Jeypore is one of the place in Odisha, which is having really very nice scenic beauty. The dense forests and wonderful waterfall, has taken attention of many of the tourists here.The tourists can even see some of the different tribal people here. This place has recently done quite a good progress in the commercial sector. The place is also having some of the mineral resource. The Chandipur Beach is one of the marvelous beaches in Odisha. The beautifully maintained beaches, along with nice delicious dishes around the beach has really attracted many people here. The waves coming from the sea really looks mind blowing. Any of the person coming here can really feel relax here. Konark Sun Temple is a popular temple. This temple is dedicated to the Sun God. This temple is equipped with very nice architecture. The beautiful walls, pillars, wheels and gigantic chariot looks really very fabulous. The temple being near from the Puri and Bhubaneshwar, it has many of the visitors coming here throughout. Rourkela is a famous city in Odisha for the various steel plants set up here. This city is also called as the “Steel city of Odisha”. In the year 2016, this city was included in the list of smart city scheme. There are many of the other attractive places her like Green Park, Vaishno Devi temple, Darjeeng, Nehru Traffic Park, etc. which are constantly attracting the tourists here. Ratnagiri Monastery include different statues of the Buddha, stupas. This place is also near from the Udayagiri, Lalitgiri and Pushpagiri. The massive excavation has discover many such statues. Various tourist do like visiting this place and different visitors can be easily seen here. The Chilika lake is one of the very beautiful lakes in India. The Chilika lake happens to be the largest coastal lagoons in India. This lake is home to many of the different kinds of fishes and birds. The fishes are in very large quantity in this lake. The arrival of different migratory birds is another attractive thing regarding this lake. The tourists visit here in very large numbers every year to enjoy this wonderful ecosystem. Another informative post.Thanks for showing me a part of India i may never have the privilege of visiting. Thanks for your comments. Yes! Odisha is full of wonderful and unexplored destinations. We will write more on the state and its culture etc. Visited your blog and your clicks are awesome! Really like your work. Would love to use some of your click in our posts (with due credit). Tell me when needed I will definitely be happy if my pictures find a place with your blog. Thanks a lot making a list of these Best places to visit in odisha. The above mentioned places are really top most visited places in odisha, one can enjoy a lot here. Thank you so much. keep sharing.